There is a way to disable it by changing the IntelliJ config file, however if you update your IDE or install a new version that setting is lost (at least on a Mac). Since that config file is located inside the Application package it is possible that changing it will invalidate the IntelliJ signature and prevent it from launch too. However, there is an easy way to hide this warning that doesn't involve modifying any files by hand. 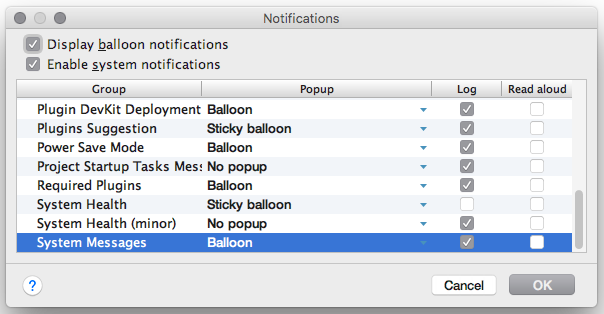 Change 'System Messages' from 'Balloon' to 'No popup' but leave the Log checkbox ticked.